Leilani Münter, a professional ARCA series driver who is also a vegan and environmentalist, wrote a letter to the Sandusky Speedway on Friday urging the racetrack to cancel an upcoming performance by the notoriously inhumane circus Carson & Barnes. Münter's letter was sent on behalf of both herself and PETA. You and I both know that tigers don't naturally jump through rings of fire, elephants don't stand on balls or balance on their heads, and bears don't ride bikes. So why do they behave this way in the circus? It's not because they are offered praise or treats in return. It's because they are violently beaten into submission. Münter goes on to say that the circus has been issued "more than 100 citations for violating the Animal Welfare Act by mistreating animals and endangering the public." In the letter Münter references PETA's undercover video which allegedly shows Carson & Barnes' elephant trainer Tim Frisco abusing the animals during a training session. Münter claims that the video "forever changed (her) understanding of how animals are used in circuses." In the video the trainer can be heard telling the other workers to use the bullhook on the elephants to "make 'em scream." Münter is no newcomer to activism on behalf of animals -- in 2012, she took to the track in a race car inspired by the documentary "The Cove", which exposed the horrific slaughtering of dolphins in Taiji, Japan. 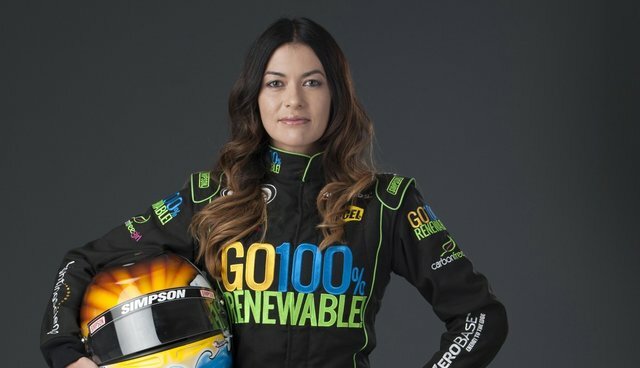 She then debuted her "Blackfish"-inspired car at the Talladega Superspeedway in May. The environmentalist ended her letter by asserting that Sandusky Speedway should cancel the event, or, at the very least, not allow any more animal-related acts in the future. "I support your speedway and appreciate your love of racing, but I can't support your decision to promote abuse and neglect." According to the circus' website, the show at Sandusky Speedway has not been cancelled. I was in attendance for one of these shows that had 6 dogs, 4 horses and 2 elephants and some animals for those in attendance to pet. These animals did nothing out of the ordinary and those 1,000+ in attendance were in aw(e) of the show that they put on. The animals appeared in good physical shape and seemed to like what they do. The general manager also noted that since the Tim Frisco video was released, new management has taken over Carson & Barnes circus.